Adam Le Fondre made an immediate impact on his A-League debut as Sydney snatched a late equaliser in Friday's 1-1 draw with Adelaide United. The journeyman striker moved to Sydney in August after his contract with Bolton Wanderers had been terminated, and he has hit the ground running with his new club. After two goals in as many FFA Cup matches, the 31-year-old marked his A-League bow with a fine 78th-minute finish to cancel out Scott Galloway's opener. 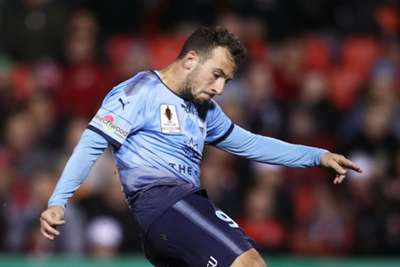 Le Fondre ghosted into the Adelaide penalty area to convert Milos Ninkovic's precise cross, the striker guiding the ball past Paul Izzo to ensure last season's premiers avoided defeat on the opening day. A competitive opening 45 minutes saw another Sydney debutant Siem de Jong impress, the former Ajax midfielder seeing an early shot blocked. Sydney looked the more likely to open the scoring but the visitors found themselves behind at the break as Galloway scored on his Adelaide debut. After a woeful cross from the right, Galloway latched onto the loose ball and curled his shot over Andrew Redmayne from 20 yards. Adelaide's attempts to find a second goal proved fruitless, however, and ultimately it cost them as Le Fondre showed great composure to open his A-League account. Le Fondre's impact will have pleased coach Steve Corica, but an injury to De Jong will have the Sydney boss concerned ahead of next weekend's clash with Western Sydney Wanderers.